What could be more rewarding for your team and the community than choosing a Charity Challenge for your next teambuilding activity? To enhance the event, Team Building Unlimited adds an element of competition and teambuilding into each of the Challenges. Enter into the Season of Giving-Year Round. Everyone is a Winner in this Philanthropic Teambuilding Activity! Building bikes for Kids is a great CRO event! Each team receives the same Bicycle parts, and our trained facilitators supervise the event. Participants will be challenged by several "children's competitive games" in order to receive the bicycle parts. The reward for building the Bicycles is the reward of giving back to the community. Bikes will be donated to the charity of your choice. Companies can choose their own charity or TeamBuilding Unlimited/Murder on the Menu can help you locate one in your area. TeamBuilding Unlimited leads you in a Bears That Care Teddy Bear team-building event! This is a great way to bring your team together while providing comfort to needy children. Each team will compete in a series of children's games and challenges to earn team points toward the "purchase" of parts and accessories needed to assemble Bears That Care. The competition continues as each person builds Teddy Bears (and other animals) and designs special Bear T-shirts that represent their team and their company. Once the bears are completed, they are presented to local organizations: Shelters, Police, Fire, Disaster, Hospitals and more. This Charity Challenge is fun and altruistic. 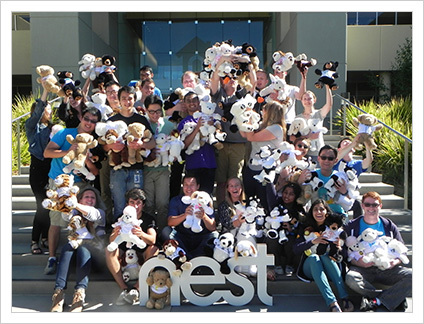 It benefits your team and the children who receive the Bears that Care. It's a Win-Win team building event for your Team. Great for your Community Service day. "We loved our Bears that Care event. It was a perfect way to end the year!" 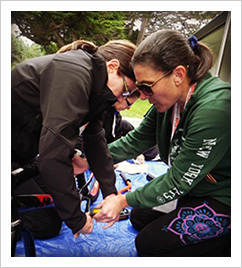 TeamBuilding Unlimited offers a special "spin" on Charitable Team Building—Wheels to Mobility: a Wheelchair Building Team event! This Charity Challenge requires teams to assemble, test and decorate wheelchairs that are then donated to the elderly or disabled to help with mobility, transport and convenience. The Wheelchairs are donated to charitable organizations, senior centers, and individual families. Our trained facilitators guide your teams through a series of challenges to receive parts and supplies. They also inspect the portable wheelchairs and coordinate the donation. Wheels to mobility! This is a win-win situation for your team, the disabled recipients, families, and charitable organizations. Reading is an essential component of every child's life. For budding bookworms or reluctant readers (or both) this cozy reading space creates a magical experience for everyone. 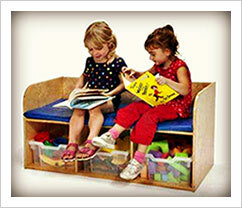 Your teams assemble and paint a children's reading bench that includes multiple book storage space. Add your creativity as your teams paint welcoming designs to the bench. Donate your Children's Reading Benches to schools or shelters. Even the tiniest corner of the classroom or shelter will be transformed by your team into a cozy, appealing retreat! Teams create, decorate and fill backpacks with school supplies that will then be donated to school groups, charities, or children's centers. Utilizing teambuilding skills such as communication, collaboration, planning, resource allocation, and creativity, your teams will excel at this philanthropic event! Working together each team becomes part of an even bigger team that makes a difference by providing basic supplies for children who really need them. This teambuilding event begins with a combination of different types of competitive Children's Games. Teams earn points to choose essential school supplies to fill the backpacks. 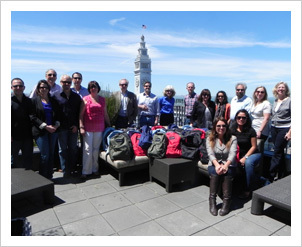 Besides teambuilding skills, a lot of team bonding goes on during this meaningful and fun charity challenge, as your employees relive their early school years through playing "children's" games and filling the backpacks! TeamBuilding Unlimited provides all the supplies, backpacks, games and prizes. Your group supplies the skills and energy. Length and complexity customized to client timeline. Work together on warm and cozy Blankets of Hope. 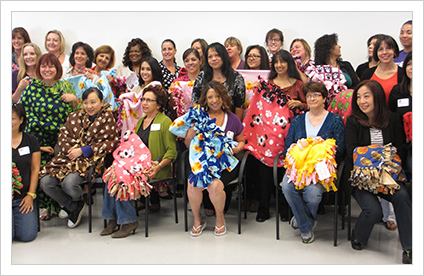 After assembling these blankets, your team will donate the Blankets of Hope to children in hospitals, shelters, and other charitable organizations. There are many different ways to assemble and finish these great fleece blankets, so there is ample room for creativity, as well as practicality. Team members will choose from a variety of patterns and styles of fleece, as well as finishing techniques. Working in teams of 2-3, these no-sew blankets are fun to make. Once the blankets are completed, they will be donated to local organizations: Shelters, Police, Fire, Disaster, Hospitals or another charity. This Charity Challenge is fun and altruistic. It benefits your team and the children who receive the Blankets of Hope. It's a Win-Win event for your group. The Red Wagon has become a symbol of American childhood. 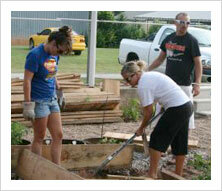 Teams work together to build wagons that will be donated to shelters, hospitals or child care centers. Our red wagons feature full-sized all-steel seamless body with no scratch edges, extra-long handle that folds under and steel wheels with semi-pneumatic rubber tires. 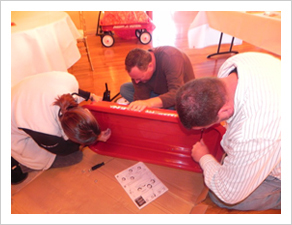 Each team will receive the same Red Wagon parts, and our trained facilitators will supervise the event. 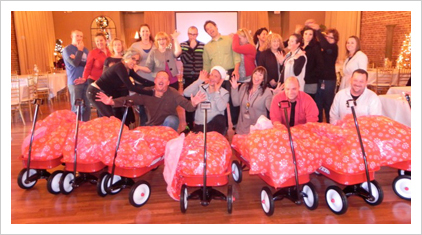 The reward for building the Red Wagons is the reward of giving back to the community. What a great team bonding activity for your team! 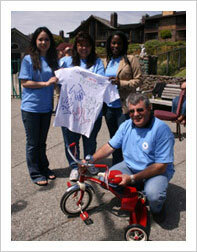 In addition, each team will design and execute a child's t-shirt to go with the donation of the Red Wagon. An optional series of children's games can be added to this event. This is a twist on our traditional Red Wagon team building event. Wagons will be filled with various supplies depending on the receiving organization: Children or Families. We even have an optional Library Wagon that participants fill with Books! Included in this event is everything in Operation Red Wagon I, with the addition that teams will also use their points from the competitive children's games to "shop" for specific items to include in the wagons. In this format, the high-energy activity quickly shifts from competitive to collaborative while trying to fill all wagons to capacity. Wagons can be filled with household supplies or children's toys, school supplies or a mixture. Working together each team becomes part of an even bigger team that makes a difference by providing basic supplies for families in need. Besides teambuilding skills, a lot of team bonding goes on during this meaningful and fun charity challenge! Wooden Blocks are the "Building Blocks" for fun and skills for children. Not only do blocks offer countless hours of entertainment, but they also help children develop many skills which are of use at home school and throughout life. Unlike other Toys, Building Blocks offer an open ended learning and playing experience. Kids can arrange them in different combinations and display their creative skills. Depending on how your participants paint and decorate the blocks, children can learn the alphabet, numbers, colors and dexterity. 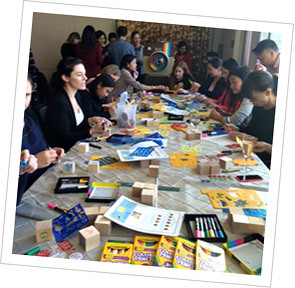 Teambuilding Unlimited facilitators will lead you through this fun painting activity, as your participants paint wooden blocks in various patterns, colors and sets. Participants are divided into teams in this creative endeavor! 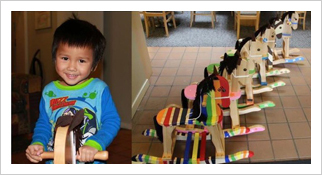 Blocks are donated to hospitals, shelters, pre-schools and other charitable organization. The painted Blocks to the Future will provide hours of entertainment and education for kids. 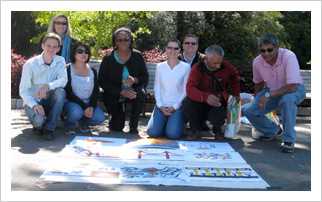 Participants work in teams to "design" a piece of a Mural/Quilt that will be donated to the charity of their choice. Each team gets 1-2 squares to design about or for the organization to whom the quilt (mural) will be donated, the holiday or the company itself. The theme may even be part of the challenge, as the teams decide on the theme of the quilt/banner. 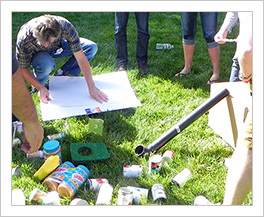 TeamBuilding Unlimited works with your teams to ensure the theme is appropriate for the charity—but the best part is the creativity of your participants. TeamBuilding Unlimited will guide your creativity, provide the materials, and facilitate the event. The "quilt" is then put together—by your teams—and donated. Favorite themes: The World, the Holiday, Children, Children's Games, Seniors, How Your Company is making a Difference—the Sky's the Limit! So tap into your creativity for a good cause. TeamBuilding Unlimited is known for its sweet team events, but our Cupcake Challenge can be a great interactive and delicious activity that capitalizes on your team's creativity and sweet tooth. This is a great event to do before or after a meal and can be incorporated into your lunch, dinner or afternoon teambuilding treat. These cupcakes can be eaten by your group or donated to a local charity—or both! In addition each team will be given materials to create a DISPLAY in which they'll be able to stack their treats into showpieces. Prizes will be given to best overall display! Each team will be given Cupcakes that can be decorated or left as is. With a variety of cupcake design supplies, instructions on technique, tools and assorted decorating materials, your team will turn their concept into reality. Basics on cupcake decoration start the teams off, but very soon, your group's creativity takes over. After the cupcakes are designed, decorated and displayed, each team will create a "commercial" to present their cupcakes to the entire group. And last but not least, participants can enjoy or donate their creations—or both. 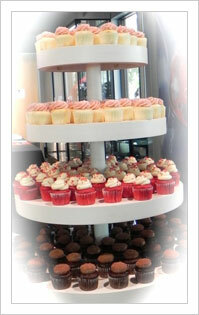 You can have your Cupcake and Eat it, too!